Techgaun team would like to wish all our site visitors happy vijaya dashami 2069. May this dashain bring peace and prosperity in everyone's life and may the world be more peaceful place than ever. I would like to include blessings (ashirbad / आशिर्वाद) offered during Dashain. आयुर द्रोण सुते श्रेयम दशरथे , सत्रुक क्षेयम रघवे, ऐश्र्वर्यम नहुशे , गतिस्च पवने, मानन्च दुर्योधने, सौर्यम शान्त नवे, बलम हलधरे , सत्यस्च कुन्तीसुते , बिज्ञ।न बिदुरे, भवन्तु भबताम, किर्तिस्च नारायणे! Ayur Drona sute sriyem Dasarathe, Satruk ksheyam Raghave, Yaishoryem Nahushe, Gatischa pawane, Manancha Duryodhane, Suaryam Shanta nave, Balam Haldhare, Satyaschha Kuntisute, Bigyanam Bidure, Bhawanu Bhabatam, Kirtischha Narayane! 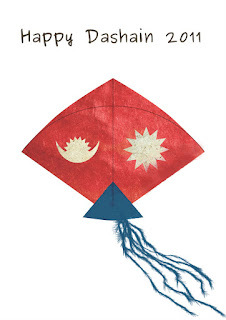 We, the team of techgaun.com would like to wish all Hindus and Nepali people happy vijaya dashami 2066/2011 and we hope this Dashain brings peace, prosperity and love in each and every house of Nepal and we also hope that the country finds some right direction to attain political stability.